Solar supporters attend a recent Solar United Neighbors event. We are excited to announce two recent commendations! Solar United Neighbors was named “one of the best” community-based nonprofits the Catalogue for Philanthropy, and was selected to participate in the Combined Federal Campaign, the largest workplace charitable giving program in the world. Both distinctions require nonprofits pass a rigorous vetting process that ensures sound finances and programmatic excellence. We are proud of our commitment to stewardship, transparency, and impact, and proud to have received these honors. After a careful vetting process, the Catalogue for Philanthropy Greater Washington selected Solar United Neighbors to be part of the Class of 2017-18. The Catalogue has a review team of over 100 charitable experts who evaluate each nominated nonprofit. Solar United Neighbors met the Catalogue’s high standards, and will be highlighted for the next four years. The Catalogue’s mission is to create visibility for the best community-based charities, fuel their growth with philanthropic dollars, and create a movement for social good in the greater Washington region. Since its inception 15 years ago, the Catalogue has helped nonprofits in the region raise $38 million, and has provided numerous trainings and engagement opportunities for nonprofits and individuals. You can check out our Catalogue for Philanthropy page here: www.cfp-dc.org/sun. 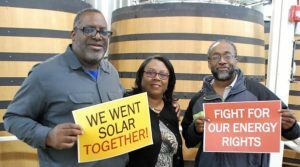 Solar United Neighbors was also selected to participate in the Combined Federal Campaign this year. The CFC is run by the U.S. Office of Personnel Management, and allows Federal staff and retirees to donate pre-tax to vetted charities.